Why am I having problems accessing onlines resources (eResources) off campus? To access library's online resources off-campus, you will be asked to authenticate with your student/staff ID number and password. If you are experiencing intermittent problems accessing the Library's online resources from off campus, please ensure that you can access other University resources, eg. Blackboard or MyND Portal. If your username or password fails, contact your Campus IT Support and request to have your password reset. Sometimes running firewall or anti-virus software may block access to library online resources. You may need to disable these programs to connect to library databases .If you are blocked by a workplace or network firewall you will need to contact your network service provider for further assistance. 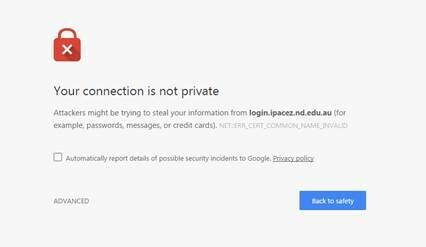 If you see a message similar to the one below, the site is valid, if ipacez.nd.edu.au or some version of this is included in the address. Click on Proceed or Advanced to progress through to the eResource. If you are still unable to access the site, please email askus@my.nd.edu.au and include screenshots of the problems you are seeing. I am an honours student. Although my student name and password are working on campus, I am unable to access anything online in the library off campus. What do I do ?